The Gome data files are freely available on the internet at (for instance) the Gome Fast Delivery Service page of the KNMI from the Netherlands. As Gome takes 3 full days to get a complete coverage of the globe (each swath width is 960 km; see figure1 of http://www.knmi.nl/gome_fd/tm3doc/tm3dam.html), a technique called data assimilation combines observed data with a numerical model (TM3-DAM) to "fill the gaps". These assimilated data files (called TM3 level 4) are available as Ascii data for 12:00 UTC of every day of the year (see the preceeding link for a more complete explanantion). 2. 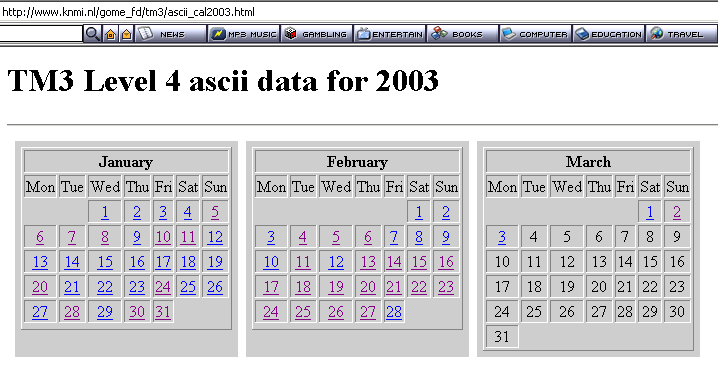 Click on the day of the month; Gome data always apply to 12:00 UTC !